Wear the Pride you have in your Heart. 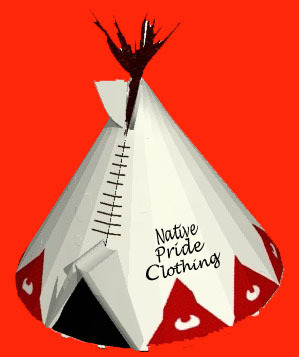 Native Pride Clothing is a Native owned and operated company dedicated in bringing Native America the highest quality of embroidery on clothing. We embroider Baseball caps, Knit caps, T-shirts, Beaded caps, Jackets, Sweatshirts, Jerseys and much more. We specialize in Native American designs and emblems. We are commited in bringing, you the customer, the best material and workmanship available. We sell primarily at Pow-wows in southwest Native America, but we are expanding and making available our products to more Native Americans located throughout Native America through our online Catalog. CAUTION: We do not have distributors in South Dakota (knockoff company trying to perpetrate to be NativePrideClothing, and/or representative/distributor), Be wary of the knock-off products, they are not the high quality of merchandise and stitching of our merchandise. For a complete list of our designs and clothing products please visit our Online Catalog. In the future we will have a complete list of all distributors and there web sites listed here on the Original, One and Only NativePride Clothing. Wear the real NativePride Clothing by real American Indian Natives. Native web ring table This Native American Ring site owned by Native1@NativePrideClothing.net. This Indigenous Peoples' Web Ring site owned by NativePrideClothing. Please bookmark page, as site is continually updated with links and product items. Just a counter down here.